The election has been and gone, yet we are none the wiser as to what form our next government will take. I wonder as to what level climate change and ETS policy are being discussed behind closed doors. We know that both the Greens and NZ First have been in favour of replacing the ETS with a carbon tax, but is this a “bottom line”? Any attempt to unwind the ETS in its current form would be a costly and time-consuming exercise and there are likely much higher priorities around the negotiating table. MPI has recently communicated to ETS participants the need to submit any new Post-1989 registration applications as soon as possible. An indicative deadline of 16th October 2017 has been provided, however MPI will not guarantee that applications submitted prior to this will be entered into the ETS by the 31st December 2017. If you are considering a new registration, or adding land to an existing participation, please contact Mike Duckett ASAP. For those ETS participants with 100 hectares or more of registered Post-1989 forest land, the deadline for collection of FMA measurement data is 31st December 2017. Inventory contractors across the country are extremely busy at present, so if you are an FMA participant and are yet to organise inventory measurement for your trees, please contact Mike Duckett to discuss. 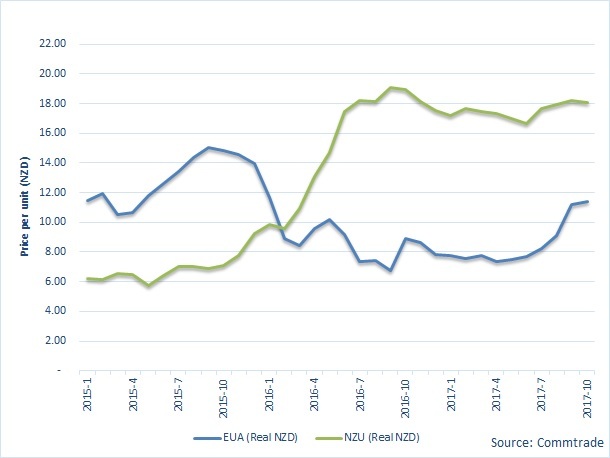 NZU prices started the month around $18.30, before dropping back as low as $17.90 immediately before the election as buyers and sellers adopted a wait and see approach. Since the start of October, prices have risen steadily to a current level of $18.40 (as at 12th October).